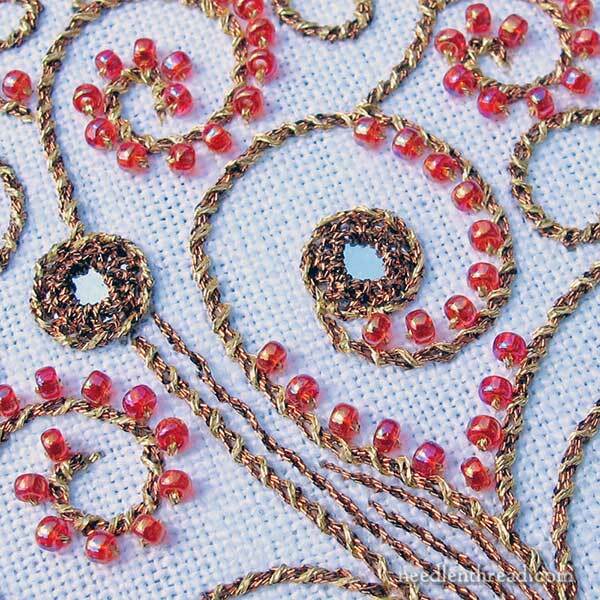 Shisha & Variations: How to Add the Magic of Mirrors (& More) to Your Needlework! I’ve long been enchanted with shisha – or mirror embroidery – and all the fascinating things you can do with it! Shisha is pretty neat stuff, and it opens up all kinds of possibilities for different types of needlework, whether you’re into surface embroidery, crazy quilting, embroidered clothing, needlepoint, counted work – any type of needlework that lends itself to embellishment! I’ve compiled a collection of shisha tutorials into a downloadable PDF for you. The techniques range from super simple shisha that takes almost no effort at all but yields stunning results, to traditional shisha, to several stitch and foundation variations that will add all kinds of interest and sparkle to your embroidery projects! 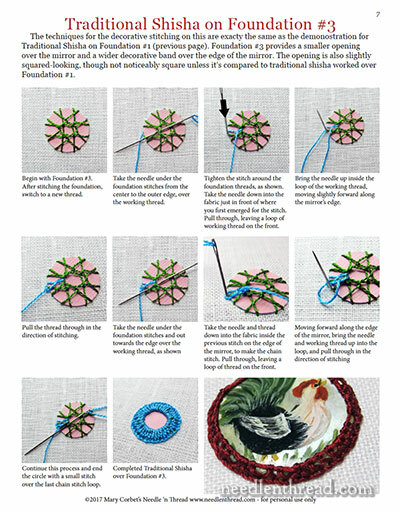 Shisha & Variations: Embroidery with Mirrors covers tips for practicing shisha, materials and supplies you can use (you can use things besides mirrors! ), four foundation stitches, a super simple approach to shisha, two approaches to traditional mirror embroidery, and three fun stitch variations. The PDF also covers shisha with beetle wings and odd shaped objects, along with three original patterns for practicing shisha embroidery – the curly tree in the photo above, a stylized bunch of shisha flowers, and a simple beetle wing (or other shaped object) and paisley design. The patterns leave room for your own interpretation, using the materials you have on hand to practice shisha. You can play with all kinds of stitches and you can add further bling and embellishment with beads and sequins, metallic threads, regular threads – whatever strikes your fancy! The ebook is packed with step-by-step photos to guarantee your success with the techniques, so whether you’re a seasoned embroiderer or just starting out, you’ll master the stitches in no time. When viewing on your computer, tablet, or mobile device, you can zoom in on the photos and see all the details close up and crystal clear! But you can also print the PDF on your printer, if you prefer the convenience of paper in front of you while you play with the techniques. And of course, there are plenty of tips and hints along the way to help you make the most of your stitching time and achieve the best results possible! Shisha & Variations is a PDF delivered to you via email with a download link right after purchasing. The download email is sent directly to the email address associated with the purchase through PayPal. You do not have to have a PayPal account to purchase – you can use a debit or credit card through PayPal without opening an account. Once your download link arrives, you click it and the ebook will begin downloading to your computer. From your computer, you can then move the ebook to any mobile device or tablet that handles PDFs. The PDF can be opened in a browser, or it can be viewed with Adobe Reader 5.0 or later. (If you don’t have Adobe Reader, you can download it at Adobe for free.) The PDF features easy to navigate thumbnails, a clickable table of contents to jump straight to the topic you want to explore, and clickable links for further information and resources. When you purchase Shisha & Variations, if you have any difficulties at all – or if you lose the file somewhere on your computer – worry not! Just email me and I’ll send you a new download link! 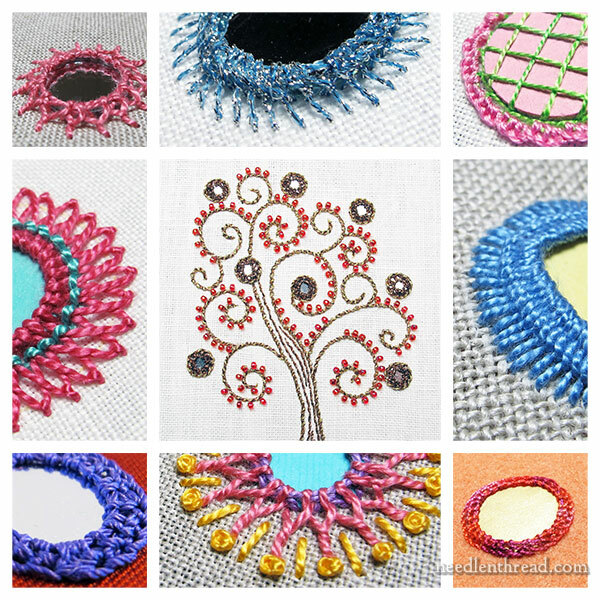 You’ll find Shisha & Variations: Embroidery with Mirrors available right here in my shop. Get it today, and this weekend, you can explore the wonders of shisha by adding a little mirror magic to your own needlework projects! In my class we had to do shishas. I could not find a source for the mica type shisha mirrors, so I bought the cheapo ones and brought them to class and shared them around. No one else could find the mica mirrors either! Mary, I could not have mastered this technique without you. Last year I found a new use for the technique, feet for bags. I love your new e books for techniques. How serendipitous! I was just this week picking up some unfinished hand-stitched quilty projects (too hot to use the iron for other projects), looked around for some information on shisha because it’s been *mumble* years and I’ve forgotten the stitch, found your excellent tutorials, practiced a bit, and today there’s an eBook! I wish to apply found metal bits to these quilts, roundish but certainly not perfect circles, so I am quite excited about the section on odd shapes. Wow! The Universe must really want me to finish these things! What great timing. I was in a Mood this morning. (Nothing horrible, just too much hot weather and way too many small annoyances.) This looks like it will be a lot of fun to play with-and my outlook on life has improved significantly. Thank you, Mary! I’d been saving all your posts about shisha work but it’s much better to have them all organised into the one place. I have a stash of old data CDs to chop up, a piece of sturdy fabric, heaps of assorted thread and a project in mind … all I need now is to download some time. Thanks, Mary, it’s arrived just fine. Another reason not to do the dusting etc! Mary, this is fantastic. I love Shisha embroidery and have had a great deal of trouble finding information to make more than the basics. Thanks for making this for us. I missed this one so I have just purchased it thanks for another wonderful e-book I will enjoy spending time looking at and I’m thinking of adding this to my quiet book page which will be felling and having different materials and Shisha mirror. Thanks for the e-book and so cheap.